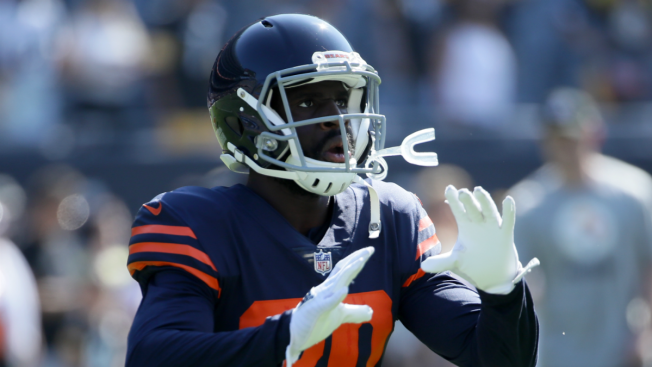 The Chicago Bears’ injury report for Thursday was identical to the one they released Wednesday, with one notable exception. Wide receiver Anthony Miller, who was a full participant in Wednesday’s workout after suffering a separated shoulder in Week 3, was not on the injury report Thursday, meaning that he is full-go and is expected to play vs. the Miami Dolphins on Sunday. The rest of the report remained the same, with cornerback Marcus Cooper missing practice with a hamstring injury and cornerback Prince Amukamara and offensive lineman Eric Kush both participated in limited fashion in the workout. For the Dolphins, several players who were not available Wednesday did get back on the field, as wide receiver Danny Amendola and safety TJ McDonald both returned to the field. Defensive end Robert Quinn was also back on the practice field for Miami. Cornerback Bobby McCain and defensive end Cameron Wake both remained sidelined for the Dolphins.